If there were such a thing as a king or queen of the box office, it would undoubtedly be the Marvel Cinematic Universe. Captain Marvel, the 21st entry in the franchise, is the latest to add to the over $7 billion dollar haul the Avengers and their allies have pulled in. But while it follows in the footsteps of other Marvel films, it stands on its own in one notable regard: it’s the first female character-led entry in the MCU. Making a Marvel film is no easy feat. These are big movies. And much like Carol Danvers (Brie Larson) spends much of Captain Marvel trying to piece together the life she can’t remember, the creative team behind the film expend a lot of effort piecing together her life for us to see on screen. With that in mind, we spoke with veteran MCU editor Debbie Berman about her editorial approach to selects, finding the heart of Captain Marvel in one scene, and why Marvel executive producers sing “Let It Go” to her. Photos courtesy of Debbie Berman. Considering it takes a large team of heroes to regularly save the Marvel Cinematic Universe, it’s appropriate that it also takes a large team to create the MCU. For Captain Marvel, Berman worked with co-editor Elliot Graham, as well as a roster of first assistants (Jessica Baclesse, Kimberly Boritz), second assistants (Basuki Juwono, Christos Voutsinas), assistant editor (Joe Galdo), finishing editors, music editors, four visual effects editors, and more. Berman appreciates having a large team supporting her because it frees her to narrow in on the creative, not technical, side of editing. “If those other things are taken off your plate, your focus can be where it needs to be, which is telling a story and finding the best version of the film,” she says. Berman began looking for that best version of Captain Marvel early by diving into the dailies footage, which were shot on the Alexa 65 in 6.5k ARRIRAW open gate at 1.9:1 aspect ratio (for the IMAX scenes; per IMDb, additional scenes were at 2.39:1). They edited on Avid in DNxHD 115, 1920 x 1080, using Apple computers, Black Magic hardware, and Blue Sky boxes for 5.1 audio. “I like to watch every second of the dailies,” Berman says.“If you’ve got the footage, you should watch every frame of it because you don’t know what gems are buried there and what information you can find to make it a better film,” she says. She kept up with them regularly during production, too. “The bins were organized based on dailies, editors’ work bins, scenes cut, and then we would make reels bins. All of the master bins of the original material were organized by the assistants in its own master folder, which also applied to the sound rolls,” she says. 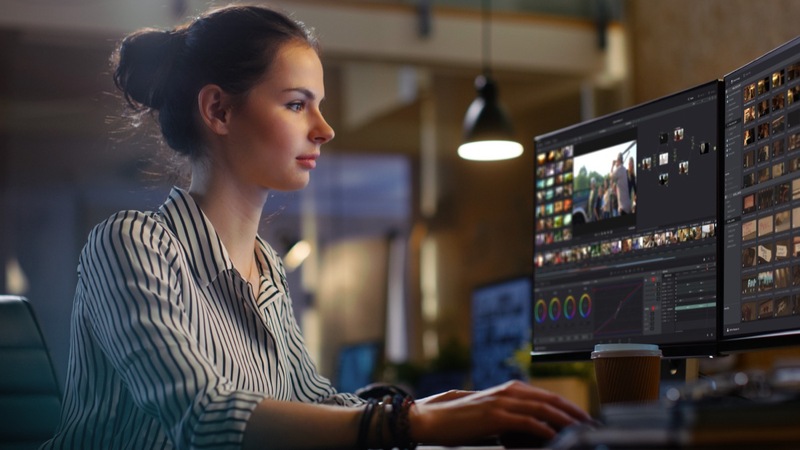 Staying on top of the footage is useful, if not essential, for a project like Captain Marvel. Not just because MCU films typically have hard release dates to hit, but because they’re (understandably) full of action scenes which produce days of non-chronological footage. Watching and assembling as footage comes in allows her to always be up on the footage and, eventually, the early cut.“They’ll shoot something one day, you’ll have that footage the next day, and then you can pretty much get it done by that day,” she says. “I do want to be in tune with the filmmakers and what they’re going for. I might not agree with the intention and I might decide to go another way, but it’s helpful to understand what the intention was and then make a decision about whether to follow it or not,” she says. While Captain Marvel co-directors Anna Boden and Ryan Fleck would visit Berman during production once a week to check in, the movie’s 11-month post-production process didn’t properly begin until a week after the film wrapped. Inevitably, the versions get discarded, but the work isn’t wasted. “You might realize several months later, ‘Now, with this version in the film, that one I did a long time ago actually fits better’ and revisit it and bring it back to life,” she says. The work distribution between Berman and co-editor Elliot Graham was slightly different. “Sometimes we’d all sit together and discuss big picture stuff. But, for the most part, we were dividing and conquering,” she says. Graham, for example, handled many of the action sequences, but not because Berman, having edited previous Marvel projects, had a problem with cutting action.“On Spider-Man: Homecoming, I really wanted to prove that a woman could cut action sequences. So, in Spidey, I did most of the action,” she says. But with Captain Marvel, her priorities were different. “Because it was Marvel’s first female-led film, and I felt like I’d proven that a woman can cut action scenes, I felt it was more important for me to focus on the heart, and the humor, of this film,” she says. One sequence was especially important for Berman to focus on. “Louisiana really is the heart of the film,” Berman says of the section of Captain Marvel where Carol Danvers goes to visit her former best friend, Maria, who may be able to help her overcome her amnesia regarding her past. It’s a “slow” sequence, with a large emphasis on the chemistry and connection between Carol and Maria. Louisiana was that to the filmmakers, as well. And Berman enhanced it with examples of how the impact of a scene can be substantially affected by the “little” things an editor does. Her intention was to immerse the audience in Danvers’ perspective so they felt it too. “You’re hearing all these voices echoing into each other and merging and feeling like, ‘Wow, this is my life, and I don’t even remember it. And there are all these stories that I don’t recall, ’” Berman says. Another example is during an extended conversation between Danvers and Maria sitting across from each other at a kitchen table—which lives in the theatrical version almost entirely as it did in Berman’s first editorial pass. The Louisiana sequence wasn’t the only moment that received some breathing room courtesy of Berman. An eleventh-hour change was made to the post-credit sequence where Goose the cat coughs up a “hairball” onto Nick Fury’s desk. “We had pretty much finished the film, and they were print mastering the film,” she explains. But then she had a creative epiphany. Originally, the shot opened on Fury’s desk, and the cat jumped up immediately. “I realized if we just pause and sit on that empty desk for a while, it’s going to build a lot more anticipation and make that scene a lot funnier. I said, ‘We need a four-second pause there!’ Everyone gave me a look, because I have been accused in the past of not letting go of the films and of trying to make it better right up to the last second,” she says.